If you’ve been following along with news on Best Coast, you know about the latest single, The Only Place. As an album opener (and title track) it sets the mood as the most modern love song for California. Why would you live anywhere else? The chorus sings. Why would we? When the world fell in love with Bethany Cosentino back in the summer of 2010 when Crazy For You came out on Mexican Summer, we fell in love with the simple love song. Songs about boyfriends, Snacks the Cat (her cat), her love affair with Mary Jane, being alone, and songs about talking to your mom on the phone. We didn’t fall in love the Cosentino’s complexity. We fell in love with her sound and the greater idea she committed to. She writes about her life and about California. And why she thinks its the Only Place to live. But it seems like a distant dream (an American Dream?) of endless summer nights and sunsets on the beach. Maybe she’s attracting that desire to move west. To find the coast. While there is nothing groundbreaking about her songwriting there might be something groundbreaking about the attention she has gotten. She grasped my attention. (And I do have tickets to see her at DC’s 930 Club in July.) Maybe for her love of California? But maybe for her sing-a-longs. I’m still unsure, but I’m no longer a closet Best Coast fan. NPR is featuring The Only Place on their first listen. And I managed an early copy. This record is clear. It sounds sharp, unlike the drowned-out sounds on Crazy For You. You can hear pieces of the acoustic guitar in track four, My Life. Known for her fuzz, Cosentino traded it in for Jon Brion (who produced early Aimee Mann records, some Fiona Apple, Dido, and lately Spoon and of Montreal.) 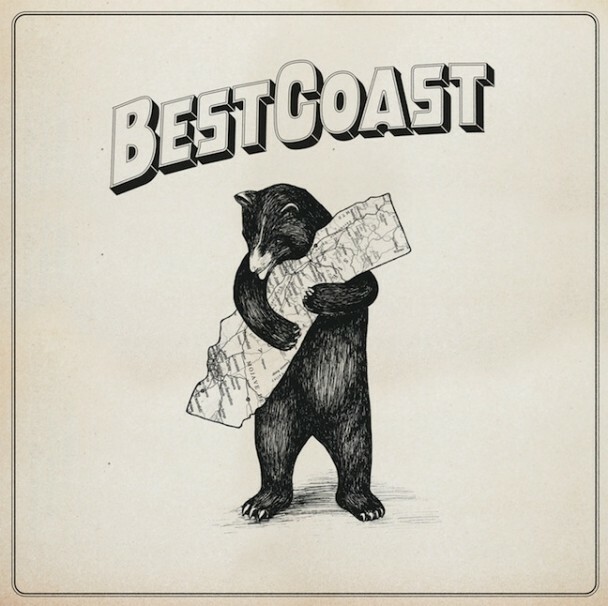 Best Coast is certainly a front-runner in the niche genre world. Known for what she does best, The Only Place (also out on Mexican Summer) can be seen as just a continuation of Crazy For You. The Only Place is also full of love songs, songs about her boyfriend, and those summer songs of longing. On Do You Love Me Like You Used To? [below] Cosentino changes it up. Just a little bit unfamiliar, like you caught her off guard. It should be the stand out track. The reverb on her vocals bleed onto tracks like Dreaming My Life Away [above]. She sings about dreams within dreams and sailing away further into that dreamscape. It’s almost as if this record – or Cosentino herself – lives in a dream land (or is at least obsessed with it.) Where her records all sound the same but everyone embraces them anyway. (Wait, isn’t that real?) The Only Place is a California soundtrack. Meant to be heard driving north on the Pacific Coast Highway out of Los Angeles. Just under 35 minutes as a whole, The Only Place is romantic. Cosentino offered us nothing new. She knows her place. And apparently, it’s in the sun.